Somali Bantustan Region of Ethiopia “Ogaden” in Open Revolt, many died, churches burned and thousand fled. Since the new Ethiopian Prime-Minister Dr. Abiy Ahmed has assumed his position a little more than two months ago, many regions in Ethiopia are in crisis. The Somali region has been plagued by violence for the last two decades. 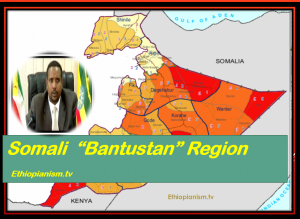 Somali region raged permanent violence declared and launched its bid for a secession of the region calling article 39 of the TPLF constitution. The regional paramilitary force, Liyu Police, of perpetrating violence in the state and called for justice. They also bemoaned how the crisis was descending into ethnic mode – between Somalis and Oromos. The region’s officials have recently been accused by the government in Addis Ababa of perpetrating rights abuses. Last month, Ethiopia fired senior prison officials thereafter details emerged of torture and other abuses in one notorious prison. Ethiopia’s Somali regional state, Mahamoud Omar, a.k.a. Abdi Illey, is being held under federal custody barely twenty-four hours after he resigned his post. Ogaden of Ethiopia today known as Somali since 1991has been in turmoil since 1977war between Ethiopian and Somali for the control. War ended with the intervention of Cuba and the Soviet Union on the side of Ethiopia and the West with Somalia. This resulted in the collapse of Somalia state and Ethiopia fall in hands of the pro-Soviet Military regime. Ogaden largest proven hydrocarbon bearing sedimentary basin in Ethiopia and covers about 350,000 sq km. Furthermore, PetroTrans, a Chinese oil and gas company invested 4 billion dollar gas development projects for Calub and Hillala.